A native of Geneva, Switzerland, and a Law graduate, Jean-Jacques spent 15 years in the Swiss foreign service. Throughout his international career, Jean-Jacques traveled, worked, and lived in conflict areas, confronted with acute human suffering and witnessing the power of human resiliency. Fluent in five languages, Jean-Jacques is passionate about building bridges among people of different cultural, political and religious backgrounds. Wishing to shift his focus from the political to the individual realm, Jean-Jacques graduated from Naropa University with an MA in Transpersonal Counseling Psychotherapy. 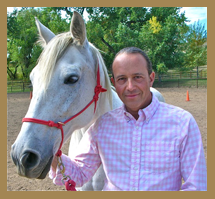 A horse lover since his childhood, Jean-Jacques is now bringing together his passion for human nature, horses, inter-species communication, and offers equine-facilitated psychotherapy services to children, adolescents, adults, couples, and families. In addition to psychotherapy, Jean-Jacques facilitates mindfulness-based leadership trainings for groups of executives, first responders, and medical teams. Jean-Jacques is a Naropa-certified Meditation instructor, and an EAGALA (Equine-Assisted Growth and Learning Association)-trained mental health specialist, a Somatic Experiencing Practitioner, and a member of the American Society of Clinical Hypnosis.